A magnitude 9.0 earthquake hit northern Japan early Friday, triggering tsunamis that caused widespread devastation and crippled a nuclear power plant. Are you in an affected area? Send an iReport. Read thefull report on the quake’s aftermath and check out our interactive explainer on Japan’s damaged nuclear reactors. [10:43 p.m. ET Thursday, 11:43 a.m. Friday in Tokyo] Japan’s National Police Agency reported at 9 a.m. Friday (8 p.m. ET Thursday) that 6,406 people are confirmed dead and 10,259 have been reported missing following last week’s 9.0-magnitude earthquake and subsequent tsunami. [9:47 p.m. ET Thursday, 10:47 a.m. Friday in Tokyo] A radiation reading of 20 millisieverts per hour has been recorded at a key annex building at the Fukushima Daiichi nuclear power plant – the highest yet recorded there – an official from the Tokyo Electric Power Company said Friday morning. In comparison, a typical chest X-ray exposes a person to about .02 millisieverts of radiation. A typical dose of background radiation in developed countries is about 3 millisieverts over an entire year. [9:02 p.m. ET Thursday, 10:02 a.m. Friday in Tokyo] Japanese stocks open higher as the United States, United Kingdom, Canada and European Central Bank agree to join Japan to intervene in currency markets. [8:49 p.m. ET Thursday, 9:49 a.m. Friday in Tokyo] Officials gave contradictory reports about the status of a new cable intended to restore power to reactor Unit No. 2 at the Fukushimi Daiichi nuclear power plant, which was damaged in the earthquake and tsunami has been emitting high levels of radiation. The International Atomic Energy Agency, citing Japanese authorities, said the power cord had reached the unit and that it would be connected once spraying of water on the No. 3 reactor building had been completed. 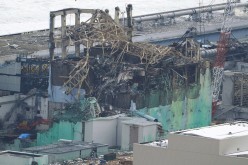 But a spokesman for the Tokyo Electric Power Co., which owns the plant, told CNN the electrical line had not been connected, though officials hoped to get it connected by the end of the day Friday. [8:30 p.m. ET Thursday, 9:30 a.m. Friday in Tokyo] The U.S. State Department said it is possible there are still Americans inside the 80-kilometer (50-mile) evacuation zone around the troubled nuclear plants, and is sending a fleet of 14 buses to Sendai – north of the evacuation zone – to evacuate as many as 600 Americans who may still be in one of the areas hardest hit by the disaster and having difficulty traveling because of road damage. [7:24 p.m. ET Thursday, 8:24 a.m. Friday in Tokyo] The Nuclear and Industrial Safety Agency says engineers have gotten an emergency diesel generator for Unit 6 running to supply energy to Units 5 and 6 at the Fukushima Daiichi plant. Water injection to the spent fuel pool is continuing. [6:01 p.m. ET Thursday, 7:01 a.m. Friday in Tokyo] Heightened radiation screening on flights arriving in the United States from Japan has triggered several low-level alerts. An American Airlines plane that arrived at Dallas-Fort Worth International Airport from Tokyo on Wednesday created a blip on equipment being used by U.S. Customs and Border Protection to screen inbound flights for radioactivity. [5:28 p.m. ET Thursday, 6:28 a.m. Friday in Tokyo] Engineers have laid a new cable to restore power to the Fukushima Daiichi nuclear power plant’s damaged unit No. 2, the International Atomic Energy Agency reported, citing Japanese authorities. They planned to reconnect power to No. 2 once the spraying of water on the No. 3 reactor building was complete. Japanese military helicopters – until shortly after midnight Thursday – dumped water on the No. 3 reactor housing, including its spent fuel pool, at the Fukushima Daiichi plant, the Tokyo Electric Power Company reported. The company said early Friday that efforts to cool the No. 3 reactor have been “somewhat effective.” No. 3 is a concern because it is the only one of the plant’s damaged units whose fuel rods contain a percentage of plutonium along with uranium. The reactor cores of units 1, 2 and 3 have suffered some damage, but the situation for those units appears to be stable, a top aide to the International Atomic Energy Agency’s director-general said. Unit 4, however, remains a major concern because spent fuel rods there are said to have been exposed, resulting in high levels of radiation, the top U.S. nuclear regulator told a congressional committee earlier this week. [4:58 p.m. ET Thursday, 5:58 a.m. Friday in Tokyo] Samaritan’s Purse is scheduled to airlift more than 90 tons of emergency supplies to Japan on Friday. Supplies including plastic sheeting for shelters, blankets, and hygiene supplies, will be loaded onto a cargo jet at North Carolina’s Charlotte/Douglas International Airport on Friday morning. The 747 is set to depart for the earthquake-ravaged country just after noon. [4:41 p.m. ET Thursday, 5:41 a.m. Friday in Tokyo] Japanese broadcaster NHK reports on shortages at stores and gas stations in Tokyo, due in part to delays in delivery (and, in the case of gasoline, a temporary drop in refining capacity because refineries are undergoing post-disaster safety checks). [4:22 p.m. ET Thursday, 5:22 a.m. Friday in Tokyo] The Dow Jones industrial average has climbed 163 points after two days of steep losses amid concerns about the U.S. economy and the crisis in Japan. [3:47 p.m. ET Thursday, 4:47 a.m. Friday in Tokyo] More from U.S. President Barack Obama’s statement outside the White House: He said that the United States is doing all it can to help Japan, and that the U.S. government has flown “hundreds of missions” and distributed thousands of pounds of food and water. Obama also said that the United States has a “responsibility to learn” from the nuclear disaster in Japan. As a result, the federal government is undertaking a comprehensive review of the situation there, he said. [3:43 p.m. ET Thursday, 4:43 a.m. Friday in Tokyo] U.S. President Barack Obama, speaking outside the White House, says that “we do not expect harmful levels of radiation to reach the United States” or U.S. territories in the Pacific. The federal government is not recommending that the American people take any special precautionary measures beyond staying informed, he said. Obama affirmed that the United States recommends that its citizens in Japan stay at least 50 miles from the distressed Fukushima Daiichi nuclear power plant because of radiation concerns, saying the recommendation was based on a careful scientific evaluation and guidelines that the United States would use on its own soil. Japan, in contrast to the U.S.’s 50-mile recommendation, has advised people living within a 20-kilometer (12-mile) radius of the plant to evacuate. It also has said that people living 20 to 30 kilometers from the site should remain inside. Japanese authorities also have banned flights over the area. [3:40 p.m. ET Thursday, 4:40 a.m. Friday in Tokyo] U.S. President Barack Obama has said that “we are bringing all available resources to bear” to monitor the situation and help Americans in Japan. The damaged nuclear plant in Japan poses a substantial risk to people who are nearby, he said outside the White House in Washington. [3:36 p.m. ET Thursday, 4:36 a.m. Friday in Tokyo] Efforts to cool down one of the reactors at a quake-damaged Japanese nuclear power plant have been “somewhat effective” since authorities turned helicopters, fire trucks and police water cannons on the facility, its owner said early Friday. Japanese military helicopters – until shortly after midnight Thursday – dumped water on the No. 3 reactor housing, including its spent fuel pool, at the Fukushima Daiichi plant, the Tokyo Electric Power Company reported. Earlier, fire and police trucks were turned on the No. 3 reactor housing for more than an hour, TEPCO reported, and the subsequent steam and lowered radioactivity levels indicated success. [2:37 p.m. ET Thursday, 3:37 a.m. Friday in Tokyo] U.S. President Barack Obama, in a visit to the Japanese Embassy in Washington, signed a book of condolences there. He told reporters that the United States will do everything to stand by Japan in its hour of need, and that he is confident that Japan will rebuild and emerge stronger than before. Obama is expected to deliver a statement on Japan in the White House Rose Garden at 3:30 p.m. ET. [2:20 p.m. ET Thursday, 3:20 a.m. Friday in Tokyo] U.S. President Barack Obama’s motorcade has made an unscheduled stop at the Japanese Embassy in Washington. [1:23 p.m. ET Thursday, 2:23 a.m. Friday in Tokyo] Gregory Jaczko, the head of the Nuclear Regulatory Commission, says there is little concern of harmful radiation levels in the United States as a result of Japan’s damaged Fukushima Daiichi nuclear power plant. The federal government’s recommendation that U.S. citizens stay at least 50 miles away from the plant in Japan remains “prudent and precautionary,” he told reporters at the White House. [12:35 p.m. ET Thursday, 1:35 a.m. Friday in Tokyo] U.S. President Barack Obama is expected to deliver a statement on Japan in the White House Rose Garden at 3:30 p.m. ET. [12:07 p.m. ET Thursday, 1:07 a.m. Friday in Tokyo] China and South Korea will send hundreds of thousands of gallons of gasoline, diesel fuel and oil products to Japan to combat fuel shortages that are hindering relief efforts, broadcaster NHK reports. [11:59 a.m. ET Thursday, 12:59 a.m. Friday in Tokyo] The U.S. military is sending a nine-member team specializing in responding to nuclear and biological hazards to Japan to advise the Japanese government, Pentagon spokesman Col. Dave Lapan said. In addition, Secretary of Defense Robert Gates has authorized $35 million for humanitarian aid. More could be authorized. [11:35 a.m. ET Thursday, 12:35 a.m. Friday in Tokyo] The Pentagon says it is offering voluntary evacuation flights to all U.S. military family members on Japan’s main island of Honshu. Pentagon spokesman Col. Dave Lapan said the potential number of evacuees could be in the thousands. Military family members will be flown to the United States on commercial aircraft, commercial charters or military aircraft as necessary, Lapan said. [11:24 a.m. ET Thursday, 12:24 a.m. Friday in Tokyo] The U.S. Embassy is making 600 seats available on buses to evacuate Americans from quake-stricken Sendai, Japan, to Tokyo. Buses will depart Sendai City Hall at 9 a.m. Friday and again at 9 a.m. Saturday if seats remain, the embassy said in a statement on its website. [11:14 a.m. ET Thursday, 12:14 a.m. Friday in Tokyo] Stars and Stripes reports that the U.S. military on Thursday began voluntary evacuations for families and dependents on four bases in Japan: Atsugi Naval Air Facility, Yokosuka Naval Base and the Army’s Camp Zama, all near Tokyo, the Misawa Air Base in northern Japan. Non-essential workers will also be allowed to leave. [11:03 a.m. ET Thursday, 12:03 a.m. Friday in Tokyo] Temple University announced Thursday it will evacuate the remaining 200 U.S. students from its campus in Tokyo over nuclear concerns. University President Ann Weaver Hart said the school is arranging a charter flight to bring the students back to the U.S. via Hong Kong. Most non-American students and staff will remain, Hart said in a statement on the school’s website. [10:47 a.m. ET Thursday, 11:47 p.m. Thursday in Tokyo] Actress Sandra Bullock sent a $1 million donation to the Amerian Red Cross this week to help with earthquake and tsunami relief efforts in Japan, the organization said Thursday. It is the largest celebrity donation to the Red Cross to be announced since the disaster struck last Friday, although the charity may have gotten large contributions that were kept confidential at the donors’ request. Click here to see how you can help. [10:17 a.m. ET Thursday, 11:17 p.m. Thursday in Tokyo] Iwaki Kyoritsu Hospital, only 45 kilometers (28 miles) from the damaged Fukushima Daiichi nuclear plant, says it has only a five-day supply of food and a three-day supply of drugs for its 300 patients, the Mainichi Daily News reports.Read the newspaper’s report of conditions at the hospital. [9:57 a.m. ET Thursday, 10:57 p.m. Thursday in Tokyo] Japan has lost 25% of its ethylene production since Friday’s quake and tsunami, Kyodo News service reports, citing Kyohei Takahashi, chairman of the Japan Petrochemical Industry Association. Ethylene is a key ingredient in making plastics and synthetic fibers, Kyodo reports, both of which are in need for water bottles and medical devices needed in quake recovery efforts. [9:47 a.m. ET Thursday, 10:47 p.m. Thursday in Tokyo] A CNN iReporter gives a video tour of the area around Yokosuka Naval Base, Japan, during a rolling blackout Thursday. Automobile lights provide the only illumination during most of the eight-minute video. [9:38 a.m. ET Thursday, 10:38 p.m. Thursday in Tokyo] High levels of radiation have been detected 30 kilometers (18.6 miles) from the damaged Fukushima Daiichi nuclear plant, broadcaster NHK reports, citing Japan’s Science Ministry. Exposure to those levels of radiation for six hours would be equivalent to the safe level of what a person can absorb in a year, according to the report. [9:19 a.m. ET Thursday, 10:19 p.m. Thursday in Tokyo] Aftershocks of magnitudes 5.6 and 5.9 shook the east coast of Japan’s main island of Honshu on Thursday night, according to the U.S. Geological Survey. [9:12 a.m. ET Thursday, 10:12 p.m. Thursday in Tokyo] A worker from the damaged Fukushima Daiichi nuclear plant has been blogging about those workers now battling to prevent a meltdown at the facility, according to The Straits Times in Singapore. On its website, The Straits Times says it hastranslated the worker’s blog. The nuclear plant staff “continue to work even at the peril of their own lives,” the worker writes. [8:49 a.m. ET Thursday, 9:49 p.m. Thursday in Tokyo] Singapore on Thursday joined the list of nations advising its citizens to leave areas near the damaged Fukushima Daiichi nuclear plant, Kyodo News service reported. Singapore’s Foreign Ministry advised its citizens to evacuate areas within 100 kilometers (62 miles) of the nuclear plant. The United States, Australia and South Korea have advised citizens to move from areas within 80 kilometers (50 miles) of the plant. Supermarkets in many cities ran out of salt after rumors circulated that radiation from the damaged Fukushima Daiichi nuclear reactor in Japan leaked into the ocean and contaminated a key source for salt in China, according to the Xinhua report. People were also buying iodized salt in hopes in could protect them from harmful effects of radiation, Xinhua reported, but the agency cited Su Xu, a researcher with the Chinese Center for Disease Control and Prevention, as saying the iodized salt would provide little help. “Iodine drugs should be used only under the medical supervision of doctors and medicine specialists,” Su is quoted as saying. [8:00 a.m. ET Thursday, 9:00 p.m. Thursday in Tokyo] The Laboratory of Applied Bioacoustics, a unit of Spain’s Polytechnic University of Catalonia, recorded the sound of the earthquake that hit Japan on Friday. The sounds had to be accelerated 16 times to make them audible to humans. [7:56 a.m. ET Thursday, 8:56p.m. Thursday in Tokyo] Efforts to cool the No. 3 reactor at the earthquake-damaged Fukushima Daiichi nuclear power plant by dumping water from helicopters and spraying it from the ground will continue, the plant’s owner said Thursday evening. [7:37 a.m. ET Thursday, 8:37 p.m. Thursday in Tokyo] An operation to spray water on the No. 3 nuclear reactor at the Fukushima Daiichi nuclear plant has ended after 40 minutes, Japan’s Defense Ministry says. Five fire trucks took turns spraying water for two minutes each, officials said. [7:30 a.m. ET Thursday, 8:30 p.m. Thursday in Tokyo] Tokyo Electric Power Company and its affiliates say they will stop building a nuclear power plant and related facilities in Oma, Aomori prefecture, according to a Kyodo News report. Construction began January for the plant on Japan’s northeastern Pacific coast with plans for completion in 2017. [7:14 a.m. ET Thursday, 8:14 p.m. Thursday in Tokyo] Electricity conservation measures are working in Tokyo and may help the city avoid a massive blackout, Kyodo News agency reports. [7:02 a.m. ET Thursday, 8:02 p.m. Thursday in Tokyo] Fire trucks have started spraying water inside reactor No. 3 at the Fukushima Daiichi nuclear plant in Japan, broadcaster NHK reports. [6:33 a.m. ET Thursday, 7:33 p.m. Thursday in Tokyo] At least 20 people have fallen ill due to possible radiation contamination – in addition to 19 injured and two missing at the damaged Fukushima Daiichi plant, the International Atomic Energy Agency reported. [6:28 a.m. ET Thursday, 7:28 p.m. Thursday in Tokyo] Japan’s National Police Agency reported at 6 p.m. Thursday (5 a.m. ET) that 5,457 people are confirmed dead; 9,508 have been reported missing; and 2,409 were injured following last week’s 9.0-magnitude earthquake and subsequent tsunami. [6:02 a.m. ET Thursday, 7:02 p.m. Thursday in Tokyo] Fourteen hospital patients died earlier this week after being transferred to an evacuation shelter in a high school in Iwaki in Fukushima prefecture, Japanese broadcaster NHK reports. The 14, mostly elderly, bedridden patients, were to be placed temporarily at the high school until new hospital space was found for them, according to the report. Two died Monday on a bus en route to the shelter and 12 died shortly after arriving, the report said. [5:53 a.m. ET Thursday, 6:53 p.m. Thursday in Tokyo] France is prepared to help Japanese citizens in the aftermath of last week’s earthquake and tsunami, the Interior ministry said Thursday. “France is ready to welcome those Japanese nationals who need care and who cannot be treated in Japan,” said Claude Guéant, French minister of interior, who spoke on French radio, Europe 1. [5:43 a.m. ET Thursday, 6:43 p.m. Thursday in Tokyo] The Japanese government has warned that a massive power failure is possible in the Tokyo area Thursday evening as cold weather puts a strain on supplies, Kyodo News service reports. Railway operators were asked to cut train service to help conserve electricity and businesses and individuals were asked to cut use as much as possible. [5:19 a.m. ET Thursday, 6:19 p.m. Thursday in Tokyo] Japanese food exports are drawing new scrutiny after the earthquake and troubles at the Fukushima Daiichi nuclear power plant. Authorities in Hong Kong, Thailand and India say they are checking samples of food from Japan for possible radioactive contamination. [4:56 a.m. ET Thursday, 5:56 p.m. Thursday in Tokyo] The death and missing toll from last week’s 9.0-magnitude earthquake and subsequent tsunami continues to increase. 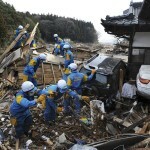 Japan’s National Police Agency reported at 4 p.m. Thursday (3 a.m. ET) that 5,429 people are confirmed dead, up 108 from the previous count; 9,594 have been reported missing, a jump of 215 people; and 2,404 were injured, an increase in 21 people. [4:30 a.m. ET Thursday, 5:30 p.m. Thursday in Tokyo] Stocks in Japan finished lower Thursday amid fears of a nuclear crisis following the nation’s catastrophic natural disaster. The Nikkei 225 index, the most prominent measure of stocks traded in Tokyo, dropped 131 points, or 1.4%. It was down as much as 454 points, or 5%, before rebounding. The index recovered nearly 6% on Wednesday after plunging a combined 16% during the first two trading days following last week’s massive earthquake and tsunami. Overall, in the past five sessions, the index is down more than 14%. [4:03 a.m. ET Thursday, 5:03 p.m. Thursday in Tokyo] NHK reports that police trucks with water cannons are on standby at the Fukushima Daiichi nuclear plant, and that the trucks will soon commence spraying water into reactor 3. [3:52 a.m. ET Thursday, 4:52 p.m. Thursday in Tokyo] Initial attempts to drop tons of water at the quake-ravaged Fukushima Daiichi nuclear power plant appear to have done little to lower potentially perilous radiation levels close to the facility. Helicopters made four passes in about a 20-minute span Thursday morning, dropping 7.5 tons of seawater each time on the facility’s No. 3 reactor in order to cool its overheated fuel pool. Experts believe steam rising from that pool, which contains at least partially exposed fuel rods, may be releasing radiation into the atmosphere. But hours later, the Tokyo Electric Power Company – which runs the plant – told Japan’s Kyodo News that the operation didn’t appear to lower radiation levels. The report suggested levels actually rose to about 3,000 microsievert per hour. It takes a year for a person to be naturally exposed to that level of radiation. An unmanned, high-altitude aircraft is helping the Japanese government assess the damage to towns and facilities from last week’s quake and tsunami, the United States Air Force said Thursday. The Global Hawk was in the air Thursday, providing images to Japanese officials, said Sgt. Major Stephen Valley of the U.S. Forces Japan. 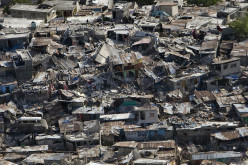 The aircraft, used in Haiti for the 7.0-magnitude earthquake in 2010, provides a broad view of the situation on the ground, surveying large areas and providing near real-time information, the Air Force said. [3:18 a.m. ET Thursday, 4:18 p.m. Thursday in Tokyo] The United States will use charter planes to evacuate about 600 family members of American diplomatic staff in Japan, the State Department said. The evacuations include the American Embassy in Tokyo, the U.S. Consulate in Nagoya and the State Department’s Foreign Service Institute in Yokohama. [3:03 a.m. ET Thursday, 4:03 p.m. Thursday in Tokyo] The number of dead from the 9.0-magnitude earthquake and subsequent tsunami in Japan has risen to 5,321, authorities said. As of 2 p.m. Thursday (1 a.m. 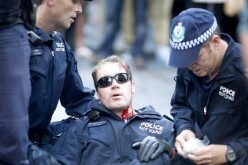 ET), 9,329 people were missing and 2,383 were injured, the National Police Agency said. [2:56 a.m. ET Thursday, 3:56 p.m. Thursday in Tokyo] Winds have been blowing from the northwest – in some cases at upwards of 30 kilometers per hour – largely pushing radiation from the Fukushima Daiichi nuclear power plant out to sea, according to meteorologists. Forecasters say they believe the wind direction may shift to a more westerly direction, still carrying possible contamination over the Pacific Ocean. Still, CNN meteorologist Ivan Cabrera noted Thursday that strong winds may make it challenging to conduct helicopter drops of water on the plant’s affected reactors, especially as much of the water may evaporate or blow as it falls. The gusts also enhance frigid wind chills in Japan, where temperatures had dropped below freezing in many locales overnight. Large parts of the Asian nation – including the cities of Sendai and Fukushima – could see snow soon. [2:32 a.m. ET Thursday, 3:32 p.m. Thursday in Tokyo] Tests in Fukushima city, located 80 kilometers (50 miles) away from the damaged nuclear plant, found radiation measuring 12.5 microsieverts per hour – well above the average reading of 0.04, but still well below that considered harmful to humans. An X-ray, for example, exposes a person to 600 microsieverts per hour of radiation, while a person is naturally exposed to 3,000 microsieverts per year. Small, harmless amounts of iodine and bequerel – both potential bi-products of a nuclear meltdown – were found in the city’s water Thursday. One positive development is that winds have been blowing from the northwest, helping push emitted radiation off to sea. [2 a.m. ET Thursday, 3 p.m. Thursday in Tokyo] Australia urged citizens within 80 kilometers (50 miles) of the damaged Fukushima Daiichi nuclear plant to evacuate. Their directive is in line with the United States, which is not allowing American troops to get within 50 miles of the plant. It is, however, a break from the recommendation by the Japanese government, which has told people to evacuate to at least 20 kilometers (12 miles) away from the reactors. [1:40 a.m. ET Thursday, 2:40 p.m. Thursday in Tokyo] As of noon Thursday (11 p.m. Wednesday ET), the number of people reported missing following the 9.0-magnitude earthquake and subsequent tsunami in Japan had climbed by more than 300 to 8,913. A count two hours earlier had the number of missing at 8,606. The number of dead remained the same – 5,718 – as did the number of wounded: 2,285, the National Police Agency said. [1 a.m. 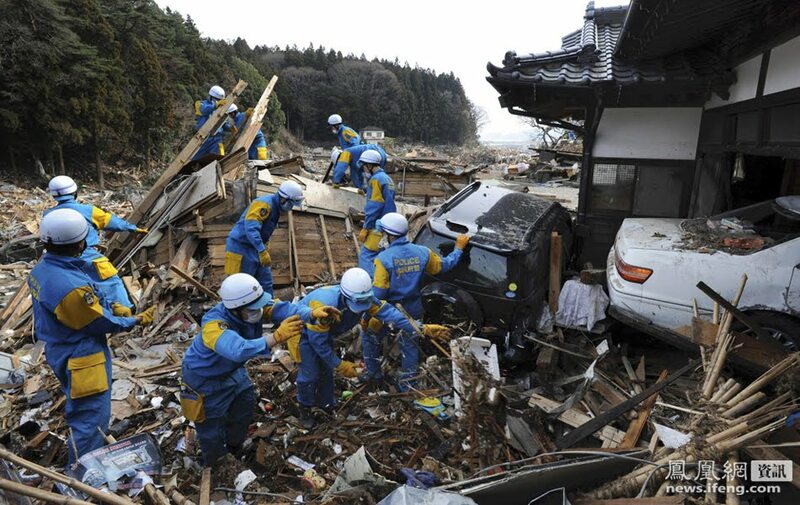 ET Thursday, 2 p.m. Thursday in Tokyo] President Barack Obama told Japanese Prime Minister Naoto Kan early Thursday that the U.S. will do what it takes to help Japan as it rebuilds following a devastating earthquake and tsunami, the White House said. The State Department is working to relocate American citizens from northeast Japan, military officials said Thursday. The department authorized the voluntary departure for family members and dependents of government officials from northeast Japan. The government is also working to arrange the departure of private citizens from affected areas, the department said. A Tokyo Electric Power company official said Thursday that – based on information gathered from a helicopter that flew over the Fukushima Daiichi nuclear power plant on Wednesday – authorities believe that there is water in a key fuel pool outside one of the plant’s most troubled reactors. Hours earlier, Gregory Jaczko, the head of the U.S. Nuclear Regulatory Commission, told Congress that spent fuel rods in Unit 4 of the plant had been exposed, resulting in the emission of “extremely high” levels of radiation. Japanese Defense Minister Toshimi Kitazawa said that he, in conjunction with the prime minister, decided early Thursday to go through with the operation to drop water over the plant’s No. 3 nuclear reactor and spray water from the ground using water-cannons. The plan to drop water from above had been aborted Wednesday, due to concerns about high radiation levels. It went through on Thursday, an airborne effort to cool down the reactor. The number of dead from the 9.0-magnitude earthquake and subsequent tsunami in Japan has risen to 5,178, authorities said. As of 10 a.m. Thursday (9 p.m. Wednesday ET), 8,606 people were missing and 2,285 were injured, the National Police Agency said. Nuclear engineers plan Thursday afternoon to begin restoring power to the stricken nuclear complex at Fukushima, a government official said. Energy Secretary Steven Chu told members of Congress on Wednesday that the unfolding nuclear crisis in Japan may be more serious than the situation faced by U.S. officials during the Three Mile Island meltdown in 1979. While most are fleeing the Fukushima nuclear power plant, 180 workers are staying put – despite the fact that doing so could result in serious illness or even death – to battle the meltdown threat. 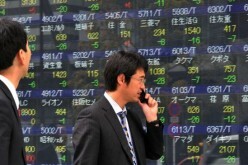 Japanese stocks rebounded slightly several hours into trading Thursday. After the Nikkei 225 index opened to a 397-point plunge, the drop was later cut to 204 points, a 2.3% decline.